This app makes it very easy for you to manage SEO titles, keywords and descriptions for your podcast site. Boost traffic to your site when people search for your podcast. 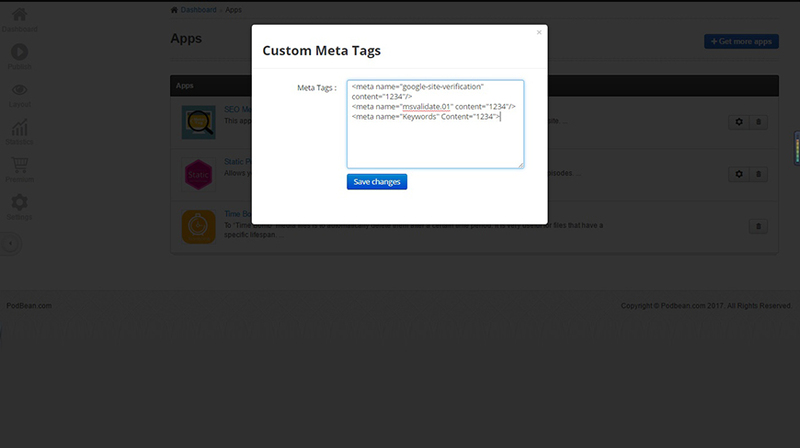 The meta tag app allows you to insert your own meta tag into the header of your podcast site. it’s very easy for you to manage SEO titles, keywords and descriptions. It’s also helpful for verifying your site by some 3rd party services. By providing this information you ensure that when search engines visit your podcast site, they see not only the information you provided in the basic HTML rendered via your episodes, but also the valuable SEO text you entered using the Meta Tag app. 3. Find the app and click on “Settings” to enter Meta Tags.